As more people purchase electric vehicles (EVs) – and countries move to ban sales of gas-guzzling cars – the world will need more charging stations. German company Sortimo plans to build the world’s biggest EV fast-charging station with 144 charging ports. It is slated for construction near the A8 highway in Germany. 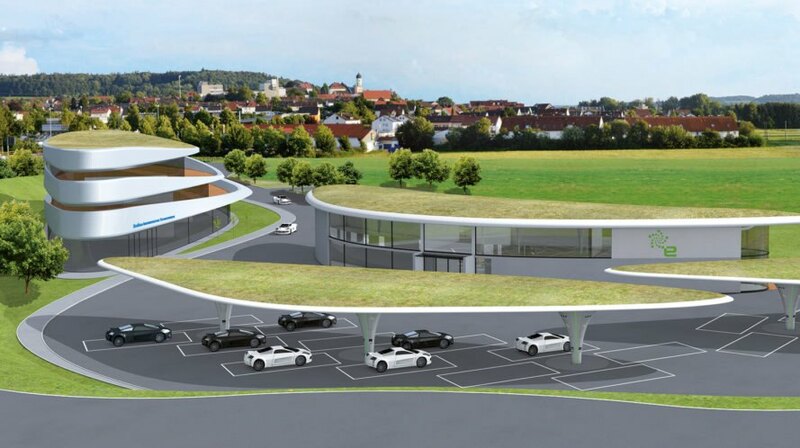 4,000 cars a day could be charged at Innovationspark Zusmarshausen, Germany’s upcoming charging station, according to the company. 24 of the 144 charging ports could be supra-superchargers with charging capacities of 350 kilowatts (kW), which beats out the Tesla Supercharger with its capacity of around 150 kW. According to Sortimo, Innovationspark Zusmarshausen could offer savings of 29.5 million liters, or around 7.8 million gallons, of fuel, and could save nearly 60,000 metric tons of carbon dioxide every year. Innovationspark Zusmarshausen goes beyond the typical vision of a gas station. According to FAZ, the station could also feature offices, shopping, and eateries; Sortimo said people could order food before they arrive so they could eat while their car charges. Commuters might be able to park and charge their vehicles simultaneously in DC parking, perhaps even while working in the offices onsite. 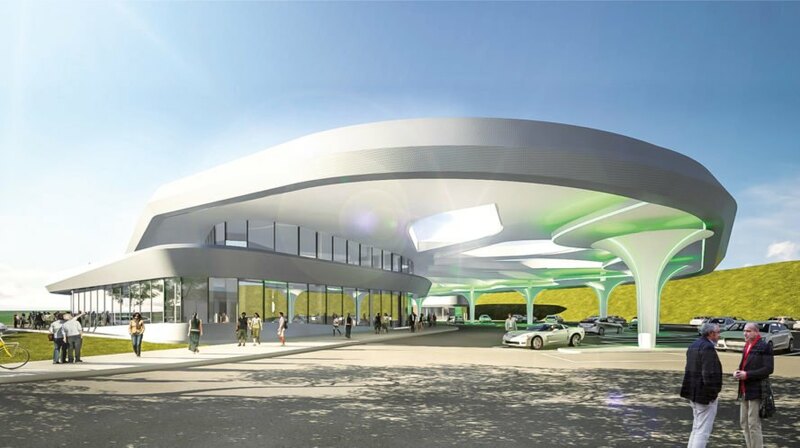 Images of the planned station suggest it could be topped with green roofs, and Sortimo mentions in their press release that Innovationspark Zusmarshausen “is very close to nature and architecturally aware of the environment,” so they envision people resting in a park at the charging station as well. As you may have guessed, renewable energy is part of the plan for the massive charging station. Sortimo said solar power can be stored at the station and used during peak times “in a network of surrounding companies and private households.” The charging stations are also integrated into Innovationspark Zusmarshausen’s thermal station management, according to Sortimo, so waste heat can help supply the buildings. FAZ said engineering firm Steinbacher Consult is also behind the design, technology, and operation. A translated version of the German press release suggests the charging station, which is receiving support from the Ministry of Transport, will be constructed in 2018. German company Sortimo plans to build a massive electric vehicle charging station. 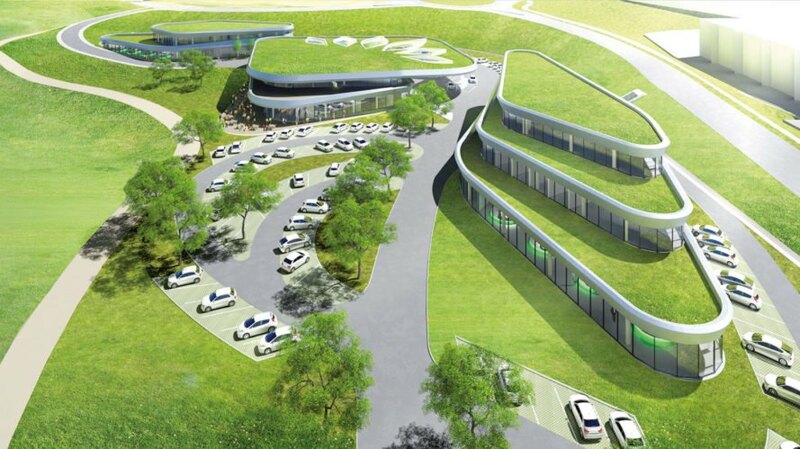 Green roofs could adorn the top of the charging station. There are 144 charging ports planned for the station. Offices, shopping, and eateries could be part of the charging station.